It does feel like that sometimes. Ah, how bittersweet our game can be. After my recent Art, Science, or Sport? 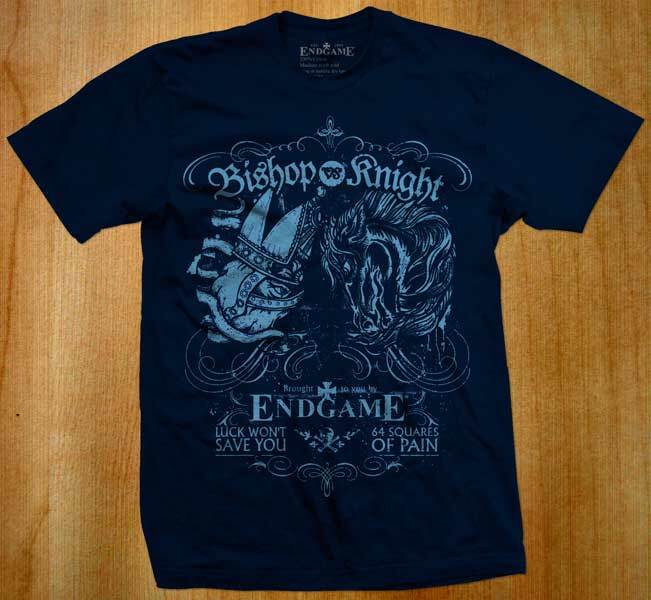 blog entry, John from Endgame Clothing offered the above fine T-shirt for my collection, and I, having a very memorable bishop vs knight endgame, was pleased to accept. Of course, as a card-carrying Member Of The Human Race, I appreciate free T-shirts (and as a materialistic chess player, I also accept "reasonably-priced" pawn and piece sacrifices). The ornately designed shirt is made of my favorite 100% cotton, and some of the company's other designs have been making the rounds recently. 2010 Samford Fellow GM Robert Hess is wearing one of Endgame Clothing's T-shirts on the cover of the June 2010 Chess Life, and the Karpov for FIDE president 2010 Fundraiser T-shirts were also designed by John's company. By association, my rating should soon be skyrocketing. Our 4-person team had won on one board, but had losing positions on two others. I needed to win this endgame to tie the match ("Captain's orders" ;-) ). Being down a pawn, I thought I was worse, but now I think the endgame is actually equal. Perhaps having the extra pawn proved to be a psychological burden for my opponent, who pursued a win to his detriment, when a draw was the logical result. 30 Nc5 Bb1 31 Nxe6 31 Nxa6? 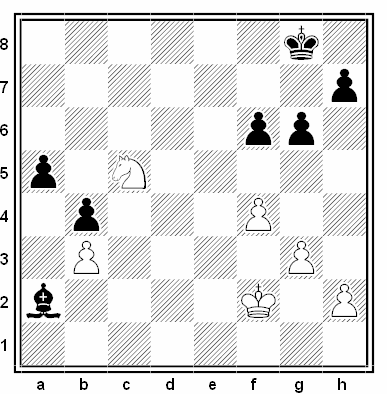 Bxa2 32 Nxb4 Bxb3 gives Black the kingside majority and all the chances, though White may be able to draw. After the text, Black still has difficulty keeping his queenside pawns. 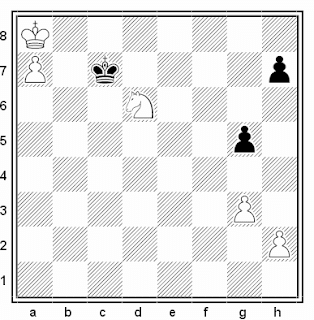 Black should consider 32...Kf7 33 Nxa6 (Given the possibility that Black can actually lose his way and worsen his position, White may actually have little motivation to play this capture immediately. 33 Kf2 Ke7 34 Ke3 Kd5 35 Nxa6 Bxb3 36 Nxb4 is a drawn ending.) 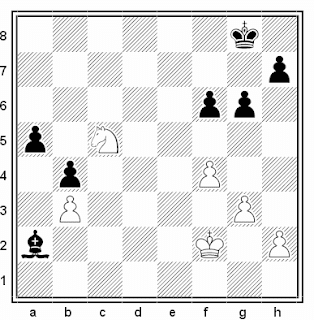 Bxb3 34 Nxb4, when a draw remains the most likely outcome. 33...a4? Black's queenside pawns are not going anywhere, but White's soon-to-be-new a-pawn is. 33...Bxb3?? 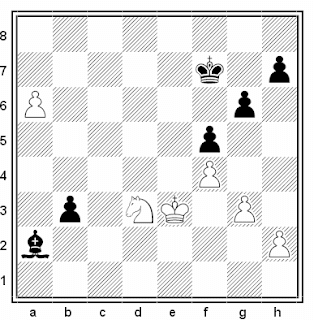 loses, since the knight can easily stop Black's a- and b-pawns until White's king comes to vacuum them up: 34 Nxb3 a4 35 Nc5 +-. and I think that the position remains a draw, no matter what fantastical lines are explored. 34 bxa4 b3? 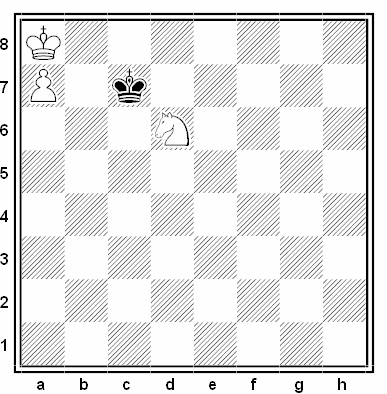 This leads to a clearly worse position for Black. 34...Bd5 at least ensures the bishop has access to both wings. 35 Nd3 Bb1? 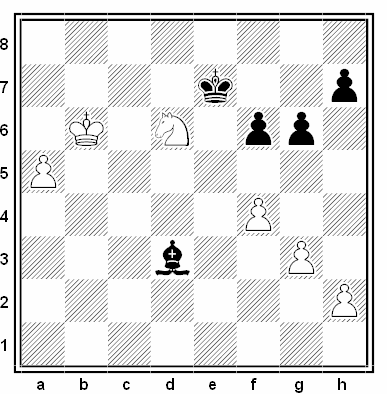 Jettisoning the pawn with 35...b2, but allowing the bishop freedom, appears to be the best chance for a draw for Black. 36 Ke3! 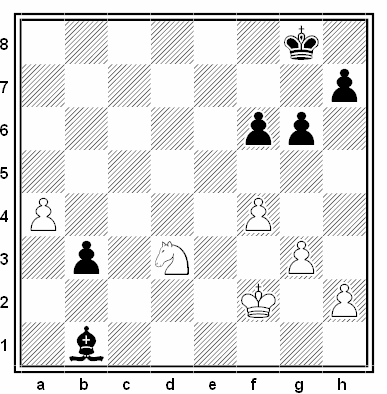 Preventing Black's bishop from getting out along the b1-h7 diagonal. 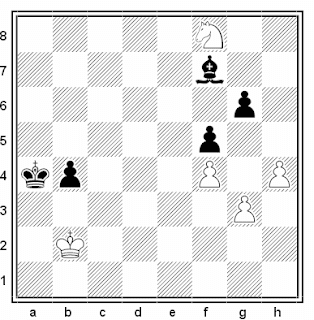 36...Bxd3 37 Kxd3 is an easy win for White, since the Black b-pawn falls, leaving White with the outside passed a-pawn, which is already "outside the square" of the Black king (i.e., cannot be prevented from promoting by the Black king). 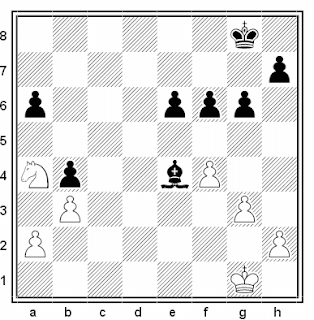 Unfortunately for Black, played by my hapless PDA chess program for this analysis line, the old box-in-the-enemy-king-in-front-of-his-own-pawn trick does not work when the opposing side has enough material to produce a pawn promotion on the other wing. 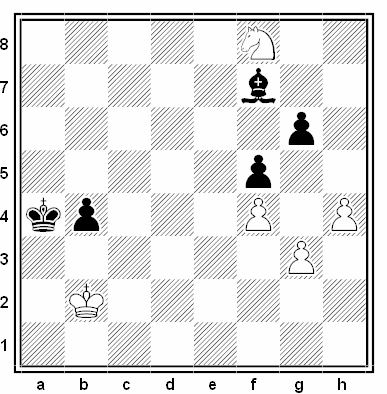 White wins from the above position because it is Black to move, so that whatever Black plays, White responds with 54 Kb8 and 55 a8=Q (or 55 a8=R ;-) ). 39 Kd4! Holding d5 (and c4), so Black's bishop will not be allowed to prevent the pawn from queening, even if he jettisons the pawn with 39...b2. That's the kind of endgame for which this T-shirt was made! Time-twistingly ironically, my opponent was the J. Muth who created another one of my favorite T-shirts (or so I have long believed, anyway), as I'd written about earlier. Of course, before the endgame, the gods have placed the middle game. Those who have observed my amazing middle game blunders know that I have rather less of a predilection for the middle game than I have for the endgame. He made innumerable friends by his kindly and genuine manner. I remember his winning a brilliant game from Dr. Vidmar in London, 1922, and laughingly patting the loser on the back, saying: "He always give[sic] me a chance of a brilliancy; he is my meat'" -- this accompanied by such a charming and good-natured smile that everyone, including Dr. Vidmar, had the impression that he had bestowed the finest compliment on his opponent. Who else could make such a remark to his adversary and convey the feeling of the utmost friendliness? If I ever come to the board and find my opponent wearing a T-shirt showing a chuckling Capablanca with the caption, "You are my middle game meat. ", I may have to run screaming from the tournament hall.